Pharmaceutical and healthcare products require a detailed analysis (chemically, biochemically, and preclinical assessments) as part of the license submission package to assure quality, safety and efficacy. 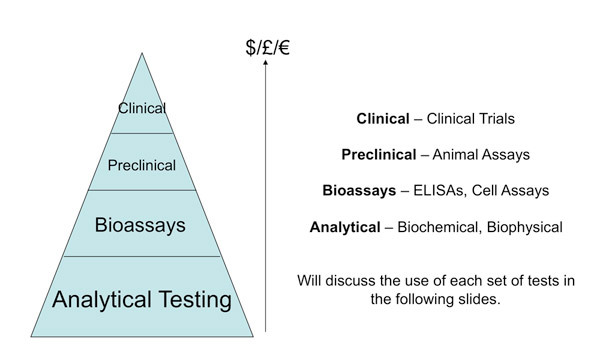 The analytical development process uses a wide range of knowledge-based techniques to gain information about a target molecule’s properties and to eliminate inappropriate or redundant methods. The methods selected probe the known structure and properties of the product, e.g. stereochemistry, protein, lipid, carbohydrate, etc. Each test method (analytical or biochemical) must be appropriately validated against ICH requirements. Methods are classed as Assay, Identity or Impurity tests. Each method requires details on its accuracy, precision, repeatability, specificity, detection limit, quantitation limit, linearity, range defined in validation activities, validation protocols and reported in validation reports. Regulatory Agencies espouse the importance of a robust and well-documented Analytical Development Strategy by their acceptance of biochemical bridging for post-marketing activities, such as Comparability Protocols / Equivalence Protocols in support of process changes and technology transfer activities. The evolution and derivation of the selected test methods (and the omission of other methods) must be documented as part of the licence submission package both at CTA and MAA stage. A detailed justification of the test specifications must also be provided. WBR offers a wide range of Analytical Development support activities including: development of Analytical Development and Product Characterisation Strategies, development and preparation of SOPs and Validation documentation, preparation and submission of Comparability Protocols and preparation of License Application submission components in eCTD format. For more details on Analytical Development and Analytical testing please contact us.